“Increase yield, improve quality, reduce operating costs, control inventory and improve information management” has become the industry mantra. To make progress means a change in the manufacturing paradigm; automatic inspection represents the methods to achieve these goals. Currently, product is manually inspected as different stages of the manufacturing process. However, the manual inspection process is slow and unpractical; human inspectors are unable to detect small defects on a consistent basis. Additionally, statistical process control is very limited in providing feedback regarding spatial defects. The industry must move to an automate solution. We have developed technologies (patent pending) using in darkfield automated defect detection used in semiconductor. 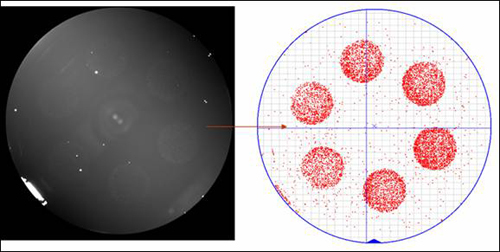 SiGlaz’s software converts images captured by CCD camera using darkfield illumination to intelligent wafer map showing particle contaminants at .2 microns or scratches on wafer surface, providing a quick feedback to any spatial anomalies during fabrication. Figure 1 Bare wafer captured by CCD camera using darkfield illumination, before and after processed by SiGlaz Intelligent Imaging Software.